It's Friday! Which means it is time for a shop update. One, there won't be any formal shop updates in September. I have a fiber event every weekend in September, and I won't be able to do both. However, I will still be dyeing, so there might be a few suprise additions to the shop during the month. Make sure you're following me on Twitter, Facebook, or Instagram to insure you don't miss out on anything. Also, the Crystal and Tachyon sales are still ongoing. Take 20% off all skeins of Crystal with the code "CrystalClear" or 25% off the remaining skeins of Tachyon with the code "Tachyon". The informal Sock Arms KAL is starting tomorrow (Sept 1) and I'm super excited! 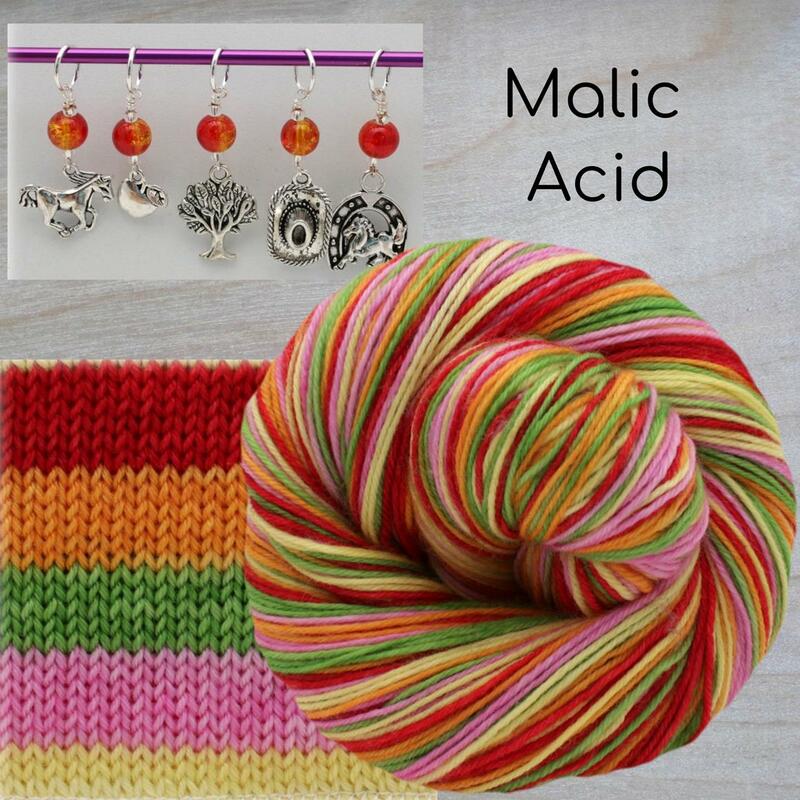 Come hang out in my Ravelry group and KAL with us! 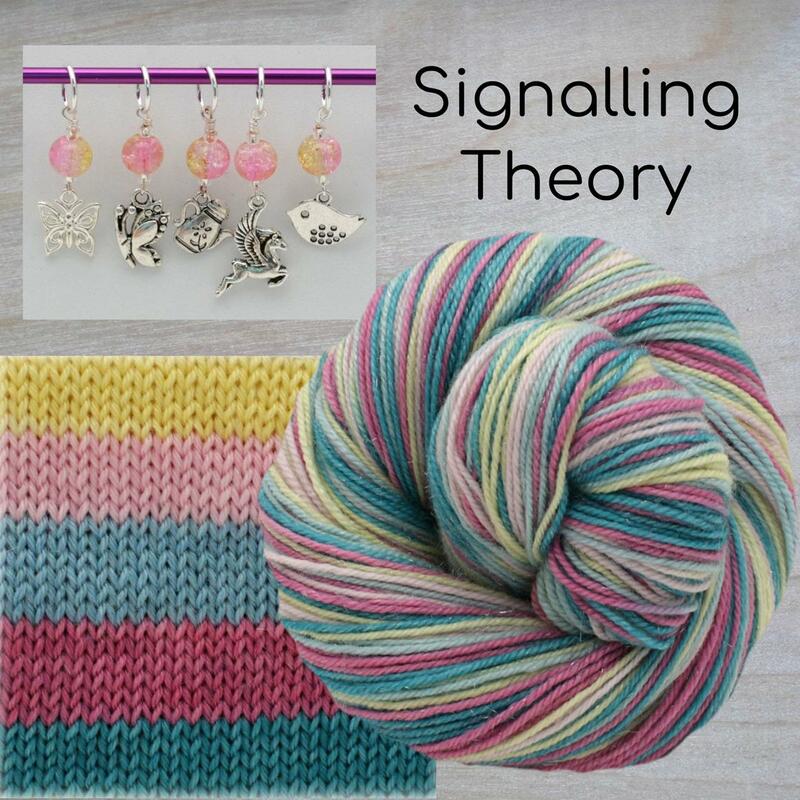 The first new color for this week is Signalling Theory. She's a shy little pony who loves animals. An even stripey, she has 6 rows each pale yellow, blush, seafoam, rose, and soft teal. I have single skeins here. There are limited edition markers available with either option. Next up is Malic Acid. She's a hard working, honest pony who will always have your back. Another even stripey, she has 6 rows each fire red, pale orange, sour apple green, pale pink orchid, and pale yellow. Malic acid is an organic compound with the molecular formula C4H6O5. It is a dicarboxylic acid that is made by all living organisms, contributes to the pleasantly sour taste of fruits, and is used as a food additive. Malic acid has two stereoisomeric forms (L- and D-enantiomers), though only the L-isomer exists naturally. Malic acid was first isolated from apple juice by Carl Wilhelm Scheele in 1785. Antoine Lavoisier in 1787 proposed the name acide malique, which is derived from the Latin word for apple, mālum—as is its genus name Malus. I have heel skeins in red, orange, green, and pink available. Next is Python, my EYFC dyeing challenge color for August. 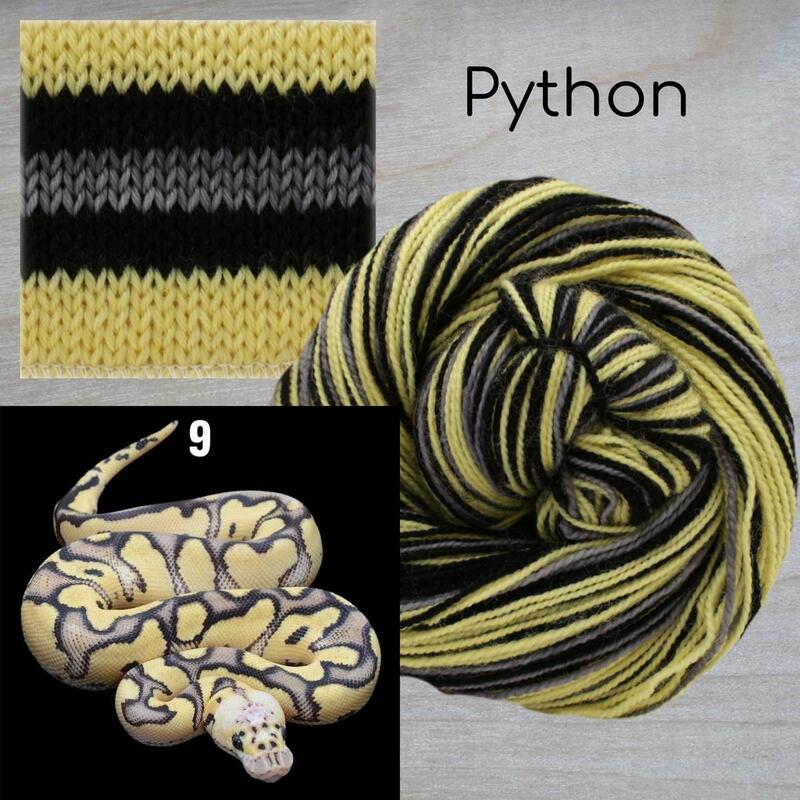 A complex stripey, this one has 10 rows pale yellow, 3 rows black, 3 rows grey, 3 rows black. Python is an interpreted high-level programming language for general-purpose programming. Created by Guido van Rossum and first released in 1991, Python has a design philosophy that emphasizes code readability, notably using significant whitespace. It provides constructs that enable clear programming on both small and large scales. In July 2018, Van Rossum stepped down as the leader in the language community after 30 years. Next is Quantum Vortex. This one started out as an oops, so I only have 10 skeins available. However, I have set up the cart to allow selling after the inventory hits zero (I hope), so if it shows 0 in stock, your order will be considered a pre-order. Pre-orders are dyed to order and will be shipped within 4-6 weeks from ordering. 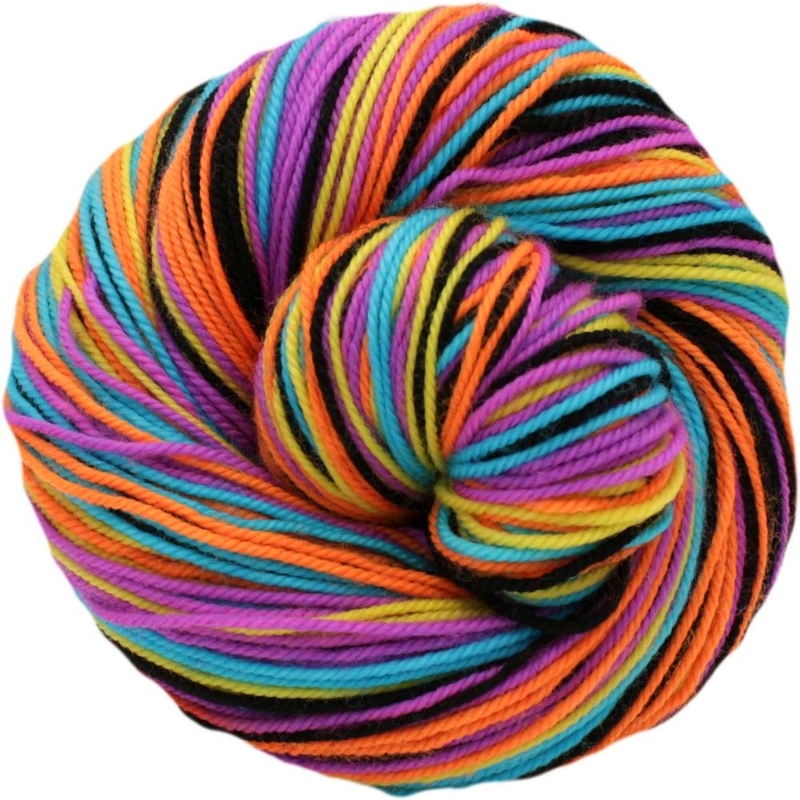 Quantum Vortex is an even stripey with 6 rows each black, sun yellow, caribbean blue, purple pop, and fuorescent orange. In physics, a quantum vortex represents a quantized flux circulation of some physical quantity. In most cases quantum vortices are a type of topological defect exhibited in superfluids and superconductors. The existence of quantum vortices was predicted by Lars Onsager in 1947 in connection with superfluid helium. Onsager also pointed out that quantum vortices describe the circulation of superfluid and conjectured that their excitations are responsible for superfluid phase transitions. Single skeins (and pre-orders) are here. 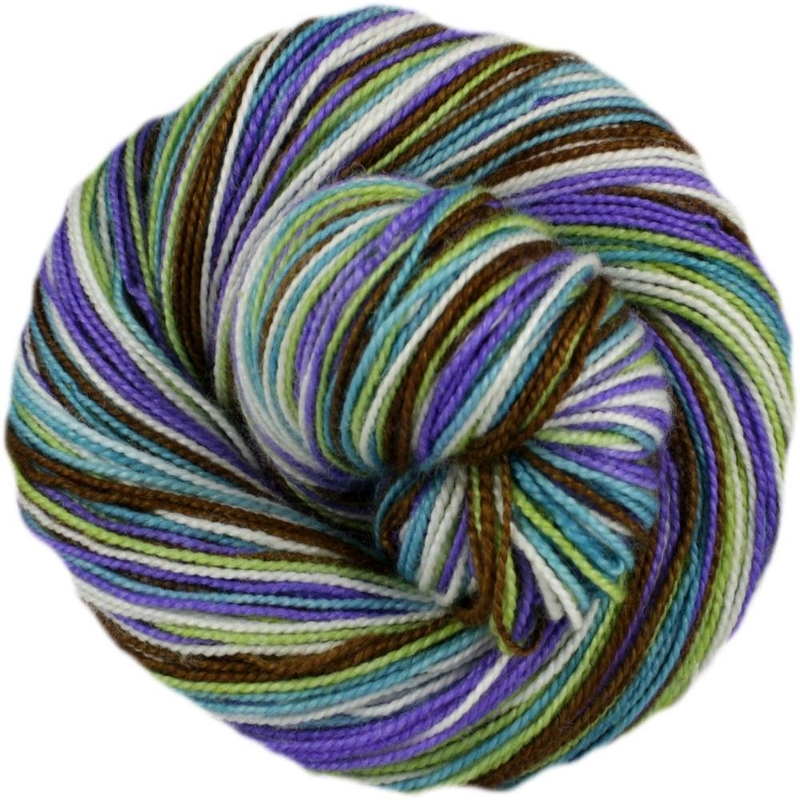 Restocking this week, Large Hadron Collider. An even stripey, with 6 rows each brown, teal, white, violet, and light green. The Large Hadron Collider (LHC) is the world's largest and most powerful particle collider, the most complex experimental facility ever built and the largest single machine in the world. It was built by the European Organization for Nuclear Research (CERN) between 1998 to 2008 in collaboration with over 10,000 scientists and hundreds of universities and laboratories, as well as more than 100 countries. It lies in a tunnel 27 kilometres (17 mi) in circumference and as deep as 175 metres (574 ft) beneath the France–Switzerland border near Geneva.